A 41 yo female with slow progressive ataxia, slurred speech since last 15 years. Truncal ataxia on neurological examination. Family history of similar complains was present. 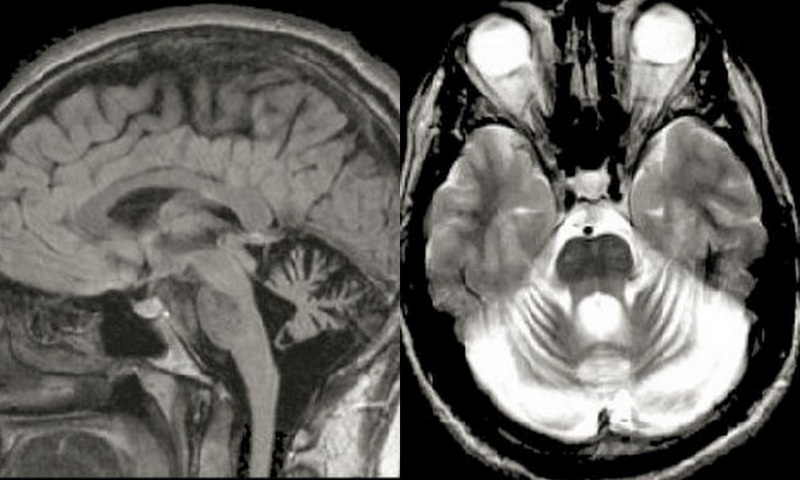 Marked atrophy of the cerebellum. Atrophy of the cerebellum is associated with many genetic conditions. Non genetic causes include chronic severe alcohol intake, paraneoplastic syndromes, drugs like Phenytoin. The nomenclature of genetic disorders associated with cerebellar atrophy is complex. Most are classified by the chromosomal location and pattern of inheritance. In many, a specific gene mutation or defective protein has been found. In the past, these disorders were referred to as cerebellar degeneration, spinocerebellar degeneration and olivopontocerebellar atrophy (OPCA) depending on whether the cerebellum, spinal cord, brainstem or a combination of any of the above affected.